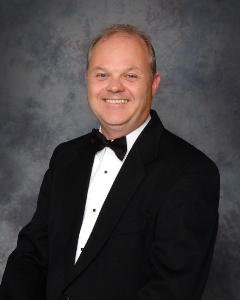 Jim Tempest joined the Delta Community Band as musical director in the fall of 2006. Jim attended Douglas College in New Westminster to study music and transferred to Western Washington University in Bellingham to complete his degree. Following university, Jim moved to London, England to continue his musical studies with some of Britain’s finest trombonists and to soak up the culture in one of the world’s greatest cities. He has been active as a professional musician and educator since his return in 1984 and has worked with all kinds of musical groups from a touring brass ensemble to jazz and symphony orchestras. In 1994, Jim returned to university to attend graduate school. He successfully defended his thesis and was awarded a Master of Arts Degree in Music Education in the fall of 1995. Later, he attended the renowned Saskatchewan Conducting Workshop twice, studying with the world famous Saito master Mirohito Okabe . Throughout his career, Jim has been an active member of the Fifteenth Field Regiment Band, the premiere band of Canada’s Army Reserve. As a member of this band, he has toured Canada from coast to coast to coast and performed in the United States, Europe and Asia. Since 2004, he has been the Director of Music. In 2016, Jim accepted the position of Senior Director of Music in the Canadian Army. In this position, he advises the commander on all issues surrounding military music, ceremonial use of bands and represents over 750 military musicians in bands from Victoria, BC to St. Johns, NFLD. Jim brings a love of music for winds to the Delta Community Band. He believes bands provide everyone the opportunity to enjoy in the creation of music and that they provide a vital source of community spirit that other activities can not supply. To that end, he works to encourage the growth of community based music making through active membership in the World Association of Symphonic Bands and Ensembles, the Canadian Band Association and the British Columbia Band Association.